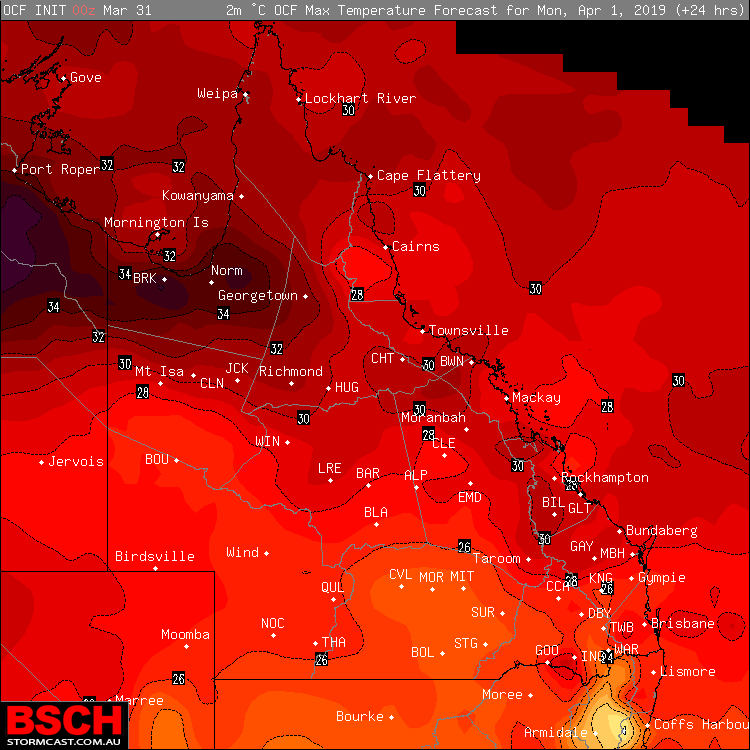 Its going to be another cool night across the Southern half of QLD again tonight with widespread below average temperatures spreading into Central QLD and isolated parts of North QLD – Above image via OCF / BSCH showing minimums for Sunday night / Monday morning. 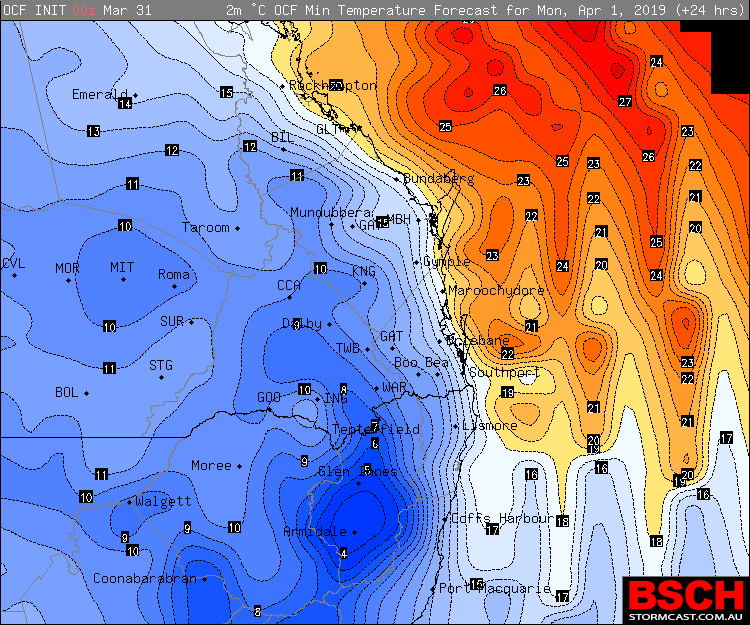 Its expected to be almost a carbon copy of what Southern and South East QLD experienced on Sunday morning as clear skies combine with some upper level cooling and light South to South West winds to produce well below average minimums. It wouldnt be a shock to see some isolated areas drop to colder temperatures than what was experienced on Sunday morning, which was largely the coldest March morning in 11 years for most areas. The coldest temperatures of course are expected to be over the Granite Belt and Southern Darling Downs where single digits are likely, possibly even down to a round 5 or 6ºc at Stanthorpe given the area recorded 6ºc on Sunday morning. Even near the Coast, minimums should drop into the low to mid teens which is around 4-6ºc below average for this time of year. Last night, areas across the Central Highlands struggled to drop below 20ºc and the Central Western districts saw the mid teens. Tonight, temperatures should be around 3-5ºc colder with that cooler air surging North. 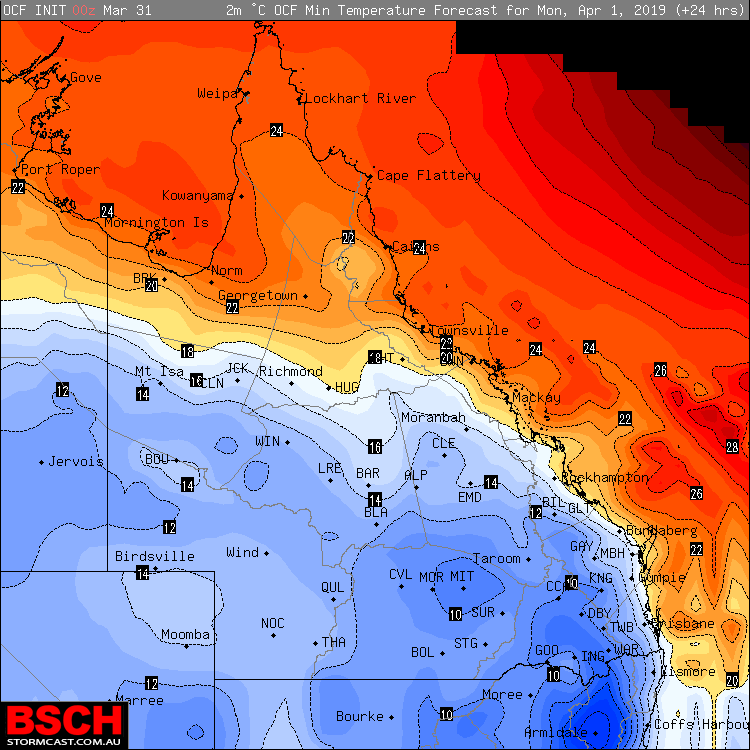 This should allow places like Emerald to see 14ºc, Longreach 12 or 13ºc – even Mackay might finally drop below 20ºc with a sharp drop off towards the Ranges. The cool air should also reach North West QLD where minimums will be around 5-8ºc below average once again (similar to last night). Maximums should be slightly warmer across the State than what was experienced on Sunday, however Inland areas will once again see a lack of humidity. Closer to the Coast it could be fractionally more humid, but it’ll still be less humid than what has been experienced across the last few weeks.